^ 2.0 2.1 2.2 復旦大學生命科學院. 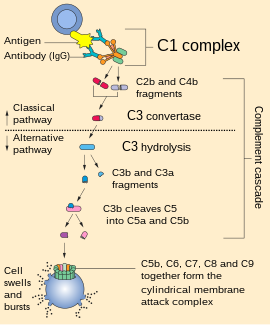 《免疫學導論》（Introduction to Immunology）. 高等教育出版社、斯普林格出版社. 1999. ISBN 9-787040-069549 （中文（简体）‎）. ^ 4.0 4.1 Abbas AK, Lichtman AH, Pillai S. Cellular and Molecular Immunology. 6th. Elsevier. 2010. ISBN 978-1-4160-3123-9.